The search giant wants to dominate your living room, but are you going to let it? Amazon has, it appears, let the cat out of the bag with regard to the UK launch if the Asus Nexus Player. The Google device will cost £80 (in the US it's $99) and will be available from Thursday if the Amazon listing is correct. At the moment, it's not really clear what Google is planning with the Nexus Player. Unlike the Chromecast, it's not especially cheap and has quite a bit of competition, including Amazon's own, and very excellent, Fire TV. 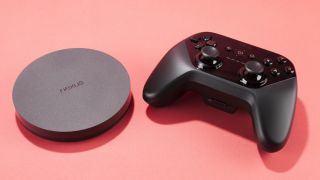 What the Nexus Player does offer is the ability to run Android TV. The only issue is, it's not clear what the future of Android TV is, given that Google TV was killed off due to a lack of interest and replaced with the much simpler Chromecast which runs a very paired-back version of Android - although it's based on Google TV at its core. Unlike Google TV though, Android TV has already won fairly substantial support, and will ship on all Sony smart TVs this year. Perhaps this will finally be the product Google has been searching for that will get it a foothold in the living room. That said, Chromecast has managed to sell well, thanks to its simplicity. It's powered by an Intel processor - a 1.8GHz Atom - and has 1GB of RAM and 8GB of storage for apps, making it powerful for a bit of gaming on top of the movies. Like Fire TV, it too can be used with a game controller. And like Chromecast, you can stream video and audio to it as a "cast" too, but this time it should support better quality, thanks to those more impressive technical specs. Will you buy a Nexus Player? Take a look at our US-based review of this device.